Sorry talk - sorry to indigenous people, sorry for destroying the environment (and for rising petrol prices even though that helps the environment), sorry for the Iraq war, sorry kids that you don't all have computer access, sorry for the economic downturn. Don't expect us to actually fix any of this, but sorry. The weakness of this sort of politics is that it is anti politics. It is hollow. Our political crisis is that the politicians are afraid to be political, to act decisively to change the world. It's too hard to change the world because not everybody agrees about what to do. But everyone can see that we are decent, caring people who are doing our best. The Lister paper is about the authors journey from being a bad teacher of computer programming to a better teacher and some of the attitudes and pitfalls encountered along the way. It's an admirable paper from that point of view, of someone becoming aware of what emerges as rather extreme deficiencies of many teachers and deciding to begin to tackle this seriously. For the author the wakeup call was too many of his students failing and students not learning how to program. He describes some ways in which his teaching has become more interactive with his students and various papers he has read in his search to become a better teacher and also to understand the reasons for the decline in IT enrolments. He takes the trouble to find out the real reasons why students are obtaining wrong answers to "easy" questions and explores some interactive techniques, such as asking students to explain "in plain English" what a short piece of code did. But along the way the author has quoted from some papers on Cognitive Load Theory and agrees with those authors that constructivism is deficient. He goes onto say that the Australasian University Teaching and Learning (T&L) communities are heavily influenced by constructivism and contrasts this with "discipline based academics" who tend to focus mainly on their disciplines at the expense of teaching and learning theory. Towards the end, however, the author repeats his call for the bringing together of theory and practice based on a "social constructivist view of the world"
Hence, Lister misunderstands the issue of what the Papert version of constructionism is because he relies on the inadequate definition emanating from these critics of constructivism. (Rather than researching what supporters of constructivism are saying.) As I pointed out in my earlier rebuttal there is only a single Papert reference in the Kirschner, Sweller and Clark paper even though Papert is recognised as an authority and has authored many papers, books and supervised many PhD theses. Now we see this harm being spread to Lister and then onto Guzdial. Plenty of scope for interactive teaching here. One final point, briefly. Having now read Marvin Minsky's book The Emotion Machine, I can now see ways to improve my rebuttal of the Kirschner, Sweller and Clark paper. This does connect to Lister's concerns about the relative inadequacy of "folk pedagogy" and citing Cognitive Load Theory as an antidote. I can see now that Cognitive Load Theory might just be another form of folk pedagogy with pseudo scientific terms like "working memory" and "long term memory", concepts that sound scientific but have yet to be explained. See Minsky, page 243. For some of these diseases of social disadvantage and the third world, Cape York has the dubious honour of having some of the highest rates in the world. The following eight areas of suggestions through which to address Indigenous disadvantage in Cape York are a synthesis of Ken Henry's seven platforms for addressing Indigenous disadvantage, the Canadian Aboriginal Horizontal Framework and Dr Richard Heazlewood's 2020 summit submission on an intervention into Cape York communities as all three have a large degree of overlap. It also contains personal thoughts gleaned from observation and thousands of conversations over years with people in Cape York ranging from specialist doctors, principals, elders and police through to parents struggling with alcoholism and children of all ages who speak frankly and honestly from their heart. I have found people's thoughts and hopes and aspirations in private are astonishingly similar across this range. Colleagues who work closely with Northern Territory (NT) communities have stated that the rhetoric surrounding the NT intervention and it's implementation was damaging and hurtful, disempowering and not well thought out, but the flow of resources and a lot of what has been done has been very positive. Surely there is room for an 'intervention' that is done 'right', that has the sense of urgency and cuts across bureaucratic barriers but without being threatening, hurtful, disempowering and poorly implemented? Taking action on the situation in Cape York requires courage, risk-taking, political will and high level leadership as well as ensuring effective implementation on the ground. Education is another area in which the computer scientist has confused form and content, but this time the confusion concerns his professional role. He perceives his principal function to provide programs and machines for use in old and new educational schemes. Well and good, but I believe he has a more complex responsibility–to work out and communicate models of the process of education itself. – To help people learn is to help them heads, various kinds of computational models. – This can best be done by a teacher who has, in his head, a reasonable model of what is in the pupil's head. – For the same reason the student, when debugging his own models and procedures, should have a model of what he is doing, and must know good debugging techniques, such as how to formulate simple but critical test cases. – It will help the student to know something about computational models and programming. The idea of debugging [note 2] itself, for example, is a very powerful concept-in contrast to the helplessness promoted by our cultural heritage about gifts, talents, and aptitudes. The latter encourages "I'm not good at this" instead of "How can I make myself better at it?" Teacher and student mental modelling are rather important, including debugging, and can be facilitated by computers properly used. But this requires a teacher who can both program the computer and understand the importance of mental modelling. If those prerequisites are missing then it's not all that surprising to discover that someone has done a research project showing that "it doesn't work". This comment by pkimelma presents a well thought out sequence for teaching Scratch using a games theme. Other comments in this thread compare Scratch with Phrogram (which has 3D graphics), Alice, Starlogo and others. Minsky has studied many great writers who have thought deeply about the human mind. Not only contemporary thinkers but he ranges across the centuries (Aristotle, Augustine, Descarte, Darwin, Franklin, Poincare, Freud etc.). Many of the sections of his book begin with quotations and summaries from these writers and then proceed onto Minsky's own independent evaluation of them. As well as that I'm discovering a very plausible view of what the research agenda for our understanding the mind ought to be. I've been summarising some of it on the learning evolves wiki. In some ways it's a deceptively simple book but quite hard to hold all of it in your mind as an integrated whole. A new book, war and decision by Douglas J. Feith Under Secretary of Defense for Policy from July 2001 until August 2005 seems to provide an authoritative account of what really happened inside the Bush administration whilst planning the Iraq war. How teachers in the developed world can run the Sugar software and activities in our computer labs which run only Windows!! 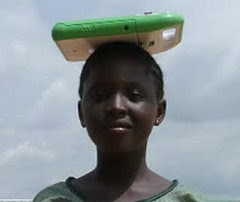 Problem: Shortage of OLPC machines in the developed world, ie. you need to be able to play with it, immerse yourself in it in order to be able to evaluate it. That's how computer learning works. With the above there is a problem that the USB key does not boot into the introductory menu seen on the bootable CD, which enables you to select the bleeding edge joyride version and choose your language. It boots into the default German language standard version of Sugar. Don't use cheap LASER USB keys, they are unreliable (failure rate 1 in 3) and slow. Kingston USB keys are far more reliable and about 5 times faster in transferring data to them. This page provides a comprehensive overview of the Pacific trial process, more so than any other Oceania page on the OLPC wiki. The Pacific RICS aims to provide Internet access to rural and remote Pacific communities that are currently not serviced by commercial operators. The technology uses small 1.2 or 1.8 metre satellite dishes and therefore requires low power to operate, which means it can be solar powered. A ‘network-in-a-box’ server provides the networking capability that allows Internet connectivity, a laser printer, WIFI wireless access and computers networked via cables. Ian will be establishing the 16 RICS pilot sites across the region. The first site was launched a month ago in Gaire, a rural community located an hour’s drive southeast drive of Port Moresby. The other pilot site in Papua New Guinea is in Bougainville, with the remaining sites in Cook Islands, Kiribati (2), Federated States of Micronesia, French Polynesia, Marshall Islands, Nauru, Samoa, Solomon Islands (2), Tokelau, Tuvalu, Tonga and Vanuatu"
has been developing infrastructure in the Solomon Islands (Solomons PFnet pdf) for some years. He stresses the need for a bottom up approach. On the surface initially making OLPCs only available to children in disadvantaged countries seems admirable and egalitarian. One of the side effects was that it made it difficult for someone like me, a supporter in the industrialised world with mainly educational knowledge (not a python hacker), to get involved. OLPCs are still quite rare in Australia. Until Christoph's post I hadn't seen this clearly as a means of controlling potential supporters. But in any organisation control is exerted through the way in which things of value are distributed. Be it information, hardware or something else. I used to be a member of a communist party which had a very top down, unelected, hierarchical leadership and which encouraged its members to go into the workplace or to be activists, to look outwards to the needs of "the masses" but not to look inwards at the quality of the leadership. There are lots of ways in which "leaders" can pretend to be doing great work for the people while at the same time shoring up their position as important leaders. It boils down to a division of labour where an elite group does the important ideological, thinking work while the rank and file members are expected to be workers, activists etc. ie. it's just a reproduction of the boss-worker relationship which the "communist party" was meant to be overthrowing. Easy enough to see how this could be translated into the OLPC community - hard working software developers who aren't all that interested in the politics of it all, in the first place. It can be hard to sort out and devastating when you finally figure out you've been led down the garden path. Very rich quotes, please click. "If we start from the premise that the young are in a religious crisis, that they doubt there is really a nature of thing and they are sure there is no world for themselves, many details of the present behavior become clearer. Alienation is a powerful motivation, of unrest, fantasy, and feckless action. It can lead.. to religious innovation, new sacraments to give life meaning. But it is a poor basis for politics, including revolutionary politics." For instance, after a hostile exchange with student radicals who had heckled him "heatedly and rudely" at a campus appearance in 1967, Goodman wrote, "suddenly I realized that they did not believe there was a nature of things. [To them] there was no knowledge but only the sociology of knowledge. They had learned so well that physical and sociological research is subsidized and conducted for the benefit of the ruling class that they were doubtful that there was such a thing as simple truth, for instance that the table was made of wood--maybe it was plastic imitation...I had imagined that the worldwide student protest had to do with changing political and moral institutions, and I was sympathetic to this. But I now saw that we had to do with a religious crisis. Not only all institutions but all learning had been corrupted by the Whore of Babylon, and there was no longer any salvation to be got from Works." Melepo, an interactive book reader developed by Eduvision (http://www.eduvision.ch/en/OurService/melepo.php) was added to the OLPCs and for the older classes seems to have been the main software used (younger kids used games too). I think this software is commercial so, in that sense, it is difficult to generalise too much from this study. The reported test results mostly concerned Eduvision's Melopo activities, rather than Sugar Activities. Since Melopo is also somewhat collaborative, the results should transfer. The most important observation is that teaching with the laptops, even under the constraints of the prevailing system, changed teacher behavior toward more effective methods. Instead of reciting instructions without a chance to try them out, students began to be encouraged to work on the computers, following instructions as they are given. Teachers began to use structured group activities and competitions, and to ask students to present material to the class. The structured techniques that the teachers put into their XO lesson plans then spilled over into their non-computer classes. Where before any question from a student was seen as an insult to the teacher, teachers began to offer individual instruction while other students were occupied on the computers. Students were encouraged to work in small groups, and began to help each other. After a time, teachers began to allow questions generally, and to set aside time for them. This enables electronic surveillance without approval being issued by a court (provided the government files required papers within a week) and provides retroactive immunity to telcos who have been breaking the old law at the behest of the Bush administration. According to Ellsberg this law breaking preceded 9/11 and has been revealed by leaks to the New York Times. The FISA Amendments Act nearly eviscerates oversight of government surveillance by allowing the Foreign Intelligence Surveillance Court (FISC) to review only general procedures for spying rather than individual warrants. The FISC will not be told any specifics about who will actually be wiretapped, thereby undercutting any meaningful role for the court and violating the Fourth Amendment’s protection against unreasonable search and seizure. The bill further trivializes court review by authorizing the government to continue a surveillance program even after the government’s general spying procedures are found insufficient or unconstitutional by the FISC. The government has the authority to wiretap through the entire appeals process, and then keep and use whatever information was gathered in the meantime. Daniel Ellsberg on FISA (video). People of my generation remember Daniel Ellsberg for his role in leaking the Pentagon Papers to the New York Times in 1971, which "demonstrated unconstitutional behavior by a succession of presidents, the violation of their oath and the violation of the oath of every one of their subordinates"
One of my year 10 students showed me the basics of how to do this. I then asked him to teach it to the class. When you mouse over the Scratch 'play note' tile drop down keyboard the key identifier, such as C, pops up, with an associated number. 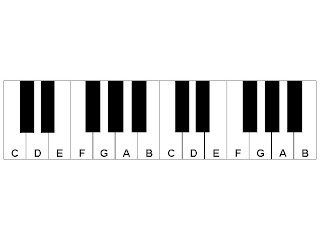 This pop up feature makes it easy to obtain an overview of a music keyboard even for someone like me who knows very little about music notation. I could take this a step further by making lots of versions of the image below showing individual keys being depressed and then mapping those images to synchronise with playing the computer keyboard. I'm thinking of writing that up as a project for the class. At this stage, the task I have set my students is to make the cat or some other sprite dance in interesting ways as they play a tune. Some might dismiss this as a publicity stunt or as a way for an already controversial character to become more controversial and widely read. That may be partially true - (nevertheless, I admire his guts for submitting himself to something which he now acknowledges is torture) - but read page 2 of Hitchens' article where he canvasses in detail the two opposing opinions of whether the United States should use waterboarding. I won't quote since to do this topic justice you need to read the whole of Hitchens' article. The deeply reflective aspect of Hitchen's writing, which is always present, should not be missed in this case.